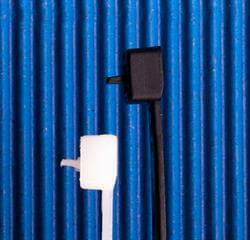 Releasable cable ties are available in two different designs. One design has an extended pawl or locking mechanism in the head of the tie which can be released with a thumbnail force. The second design has a large horizontal tab feature which releases the tie with a push onto the tab. Releasable Cable Ties with the Extended Pawl are available in 4” – 14” lengths with a 40 or 50 lb tensile strength. Releasable Pawl cable ties are available in bulk 1000 or 500 pieces bags or smaller 100 piece bags. Tensile Strengths – 40 lbs. and 50 lbs.